Pictured is a concept plan for the proposed Grden property on Peachblow Road in Delaware. 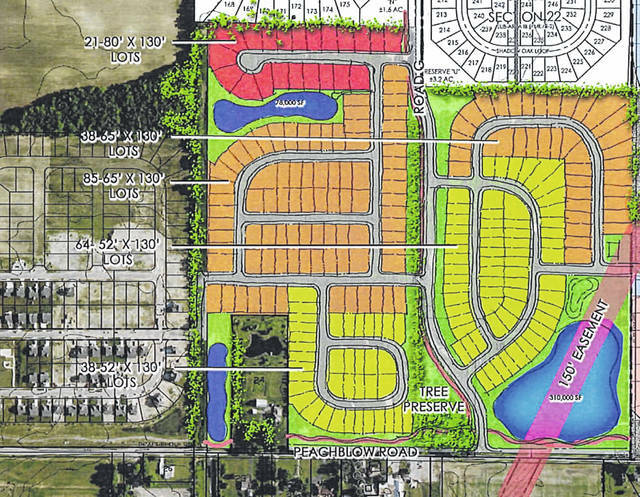 The proposed development, located east of the Belmont Place subdivision, is shown in color. The City of Delaware Planning Commission reviewed a concept plan for a subdivision that would be constructed on Peachblow Road, just east of the Belmont Place subdivision, at Wednesday’s meeting. Grden Property is seeking to develop the approximately 102-acre site for 246 single-family homes. Currently, the land sits in Berlin Township but has long been planned for annexation once developed. If annexed, a zoning change to a planned mixed-use (PMU) would be requested to keep in line with the Glenross and Belmont Place communities north and west of the proposed development, respectively. Under the proposed concept, the majority of lots would range from 6,760 to 8,450 square feet, with 21 lots totaling 10,400 square feet. The proposed density of the subdivision, which has become a point of contention with prior developments, would be 2.41 units per acre. 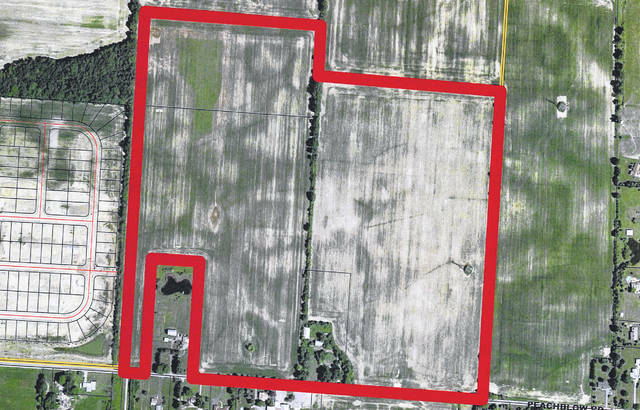 The single access point would be off Peachblow Road and would extend north to connect with Winterbourne Drive coming south from the Communities at Glenross subdivision. A connection west to the Belmont Place subdivision would also be constructed. One hundred and two of the lots are slated to be 52 feet wide, which city documents called “unique.” During the meeting, Bob Grden discussed what he sees as a trend shift in the housing market. He cited a 2014 National Resources Defense Council (NRDC) report that, according to Grden, suggested millennials would not represent a significant demographic in the homebuying market in years to come. Reading from another report, Grden suggested millennials are increasingly deciding to get married later and have fewer children, thus making smaller homes more attractive. Commissioner Jim Halter voiced his concerns on the smaller size of many of the development’s units, particularly because of the city’s stance when they dealt with previous builds. Because the subdivision is only its conceptual stage, no vote was required on the development during Wednesday’s meeting. With many more details to be solidified and discussions to be held, the next step for Grden and the subdivision will be to submit a preliminary development plan to be reviewed by planning commission.